A Kite for Moon, written by New York Times bestselling author Jane Yolen and Heidi E.Y. 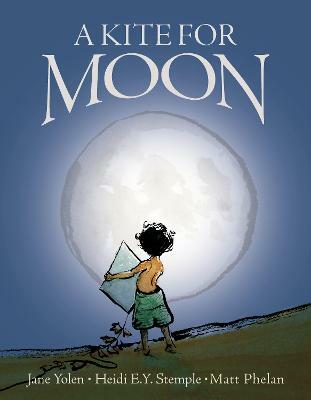 Stemple and illustrated by award-winning artist Matt Phelan, tells a heartfelt story about a young boy's fascination and unlikely friendship with the moon. Dedicated to Neil Armstrong, this bo... read full description below. By Stemple, Heidi E. y. A Kite for Moon, written by New York Times bestselling author of How Do Dinosaurs Say Goodnight? Jane Yolen and her daughter, Heidi E. Y. Stemple, tells a heartfelt story about a young boy's fascination and unlikely friendship with the moon. With whimsical illustrations by award-winning artist Matt Phelan, the story begins when the little boy, who is flying his kite, notices a sad Moon. He sends up kites to her, even writing notes to Moon promising he will come see her someday. This promise propels him through years and years of studying, learning, and training to be an astronaut! Dedicated to Neil Armstrong, and a perfect children's book to help celebrate the 50th anniversary of the first United States moon landing, the cover of this book will captivate readers with eye-catching spot UV, foil, and embossing. Jane has been called the Hans Christian Andersen of America and the Aesop of the twentieth century. She sets the highest standard for the industry, not only in the meaningful body of work she has created, but also in her support of fellow authors and artists. Her books range from the bestselling How Do Dinosaurs series to the Caldecott winning Owl Moon to popular novels such as The Devil's Arithmetic, Snow in Summer, and The Young Merlin Trilogy, to award-winning books of poetry such as Grumbles from the Forest, and A Mirror to Nature. In all, she has written over 335 books (she's lost count), won numerous awards (one even set her good coat on fire), and has been given six honorary doctorates in literature. For more information, please visit www.janeyolen.com. Heidi E.Y. Stemple didn't want to be a writer when she grew up. It wasn't until she was 28 years old that she gave in and joined the family business, publishing her first short story in a book called Famous Writers and Their Kids Write Spooky Stories. The famous writer was her mom, author Jane Yolen. Since then, she has published twenty books and numerous short stories and poems, mostly for children. Matt Phelan is the illustrator of many books for young readers, including Flora's Very Windy Day by Jeanne Birdsall, Xander's Panda Party by Linda Sue Park, and The Higher Power of Lucky by Susan Patron, winner of the 2007 Newbery Medal. He is the author/illustrator of the picture books Druthers and Pignic, as well as the graphic novels The Storm in the Barn (winner of the Scott O'Dell Award), Around the World, Bluffton, and Snow White. Matt lives in Ardmore, Pennsylvania.